From July 10-14, 2017, Fraunhofer FOKUS business unit FAME participated at the "IEEE International Conference On Multimedia And Expo (ICME) 2017" in Hong Kong. ICME is one of the most important multimedia conferences and sponsored by four IEEE societies since 2000. Fraunhofer FOKUS business unit FAME presented 2 papers related to the Cloud-based 360° Video Playout. The first paper “Towards a high efficient 360° video processing and streaming solution in a multiscreen environment” was accepted in the 4th IEEE International Workshop on Mobile Multimedia Computing (MMC 2017) which was held in conjunction with the ICME conference. 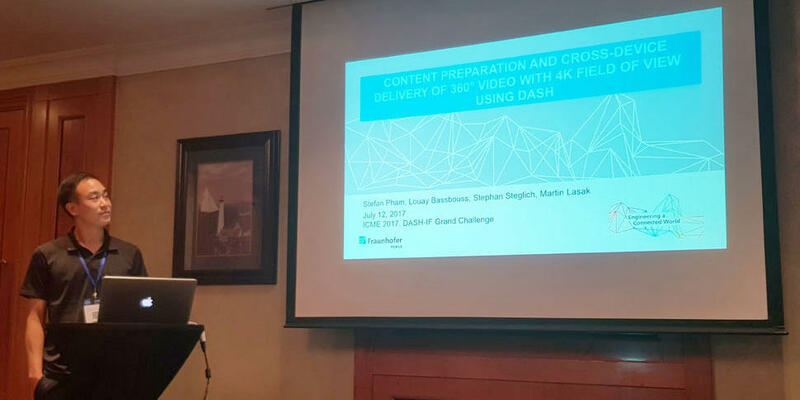 It was presented by Dr. Stephan Steglich and focuses on two main challenges: the efficient streaming of high quality 360° video content with existing content delivery networks and a reduced required bandwidth as well as on devices with constrained capabilities such as TV sets. The second paper “Content preparation and cross-device delivery of 360° video with 4K field of view using DASH” is a demo paper. It was accepted in the “DASH-IF Grand Challenge: Dynamic Adaptive Streaming over HTTP” and presented by Stefan Pham. This paper provides a solution that uses server-side-transformation to enable 360° streaming of 4K FOVs, which originate from a 16K 360° video. The interoperable delivery of protected media content to web browsers can be accomplished with W3C HTML5 Media Source Extensions and Encrypted media Extensions, MPEG DASH and Common Encryption.